“Bizarre.” “Interesting.” “Giant transit”. That were the reactions of Planet Hunters project volunteers when they got their first look at the light curve of the otherwise normal sun-like star KIC 8462852 nearly. Of the more than 150,000 stars under constant observation during the four years of NASA’s primary Kepler Mission (2009-2013), this one stands alone for the inexplicable dips in its light. While almost certainly naturally-caused, some have suggested we consider other possibilities. Kepler-11, a sun-like star orbited by six planets. 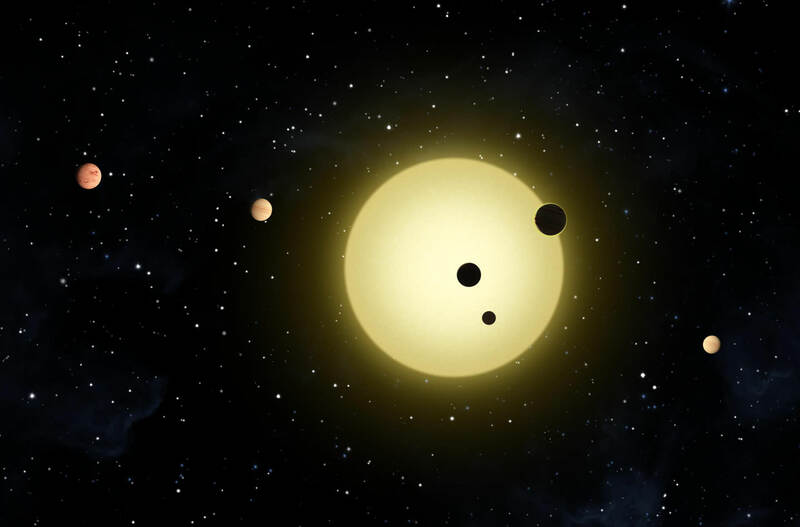 At times, two or more planets pass in front of the star at once, as shown in this artist’s conception of a simultaneous transit of three planets observed by the Kepler spacecraft on Aug. 26, 2010. During each pass or transit, the star’s light fades in a periodic way. You’ll recall that the orbiting Kepler observatory continuously monitored stars in a fixed field of view focused on the constellations Lyra and Cygnus hoping to catch periodic dips in their light caused by transiting planets. If a drop was seen, more transits were observed to confirm the detection of a new exoplanet. And catch it did. Kepler found 1,013 confirmed exoplanets in 440 star systems as of January 2015 with 3,199 unconfirmed candidates. Measuring the amount of light the planet temporarily “robbed” from its host star allowed astronomers to determine its diameter, while the length of time between transits yielded its orbital period. Volunteers with the Planet Hunters project, one of many citizen science programs under the umbrella of Zooniverse, harness the power of the human eye to examine Kepler light curves (a graph of a star’s changing light intensity over time), looking for repeating patterns that might indicate orbiting planets. They were the first to meet up with the perplexing KIC 8462852. 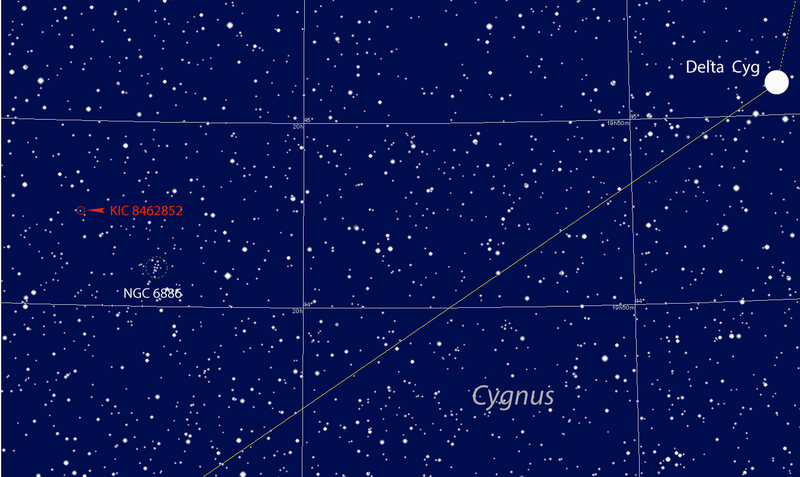 This magnitude +11.7 star in Cygnus, hotter and half again as big as the Sun, showed dips all over the place. Around Day 800 during Kepler’s run, it faded by 15% then resumed a steady brightness until Days 1510-1570, when it underwent a whole series of dips including one that dimmed the star by 22%. That’s huge! Consider that an exo-Earth blocks only a fraction of a percent of a star’s light; even a Jupiter-sized world, the norm among extrasolar planets, soaks up about a percent. Exoplanets also show regular, repeatable light curves as they enter, cross and then exit the faces of their host stars. KIC 8462852’s dips are wildly a-periodic. Whatever’s causing the flickering can’t be a planet. With great care, the researchers ruled out many possibilities: instrumental errors, starspots (like sunspots but on other stars), dust rings seen around young, evolving stars (this is an older star) and pulsations that cover a star with light-sucking dust clouds. What about a collision between two planets? That would generate lots of material along with huge clouds of dust that could easily choke off a star’s light in rapid and irregular fashion. A great idea except that dust absorbs light from its host star, warms up and glows in infrared light. We should be able to see this “infrared excess” if it were there, but instead KIC 8462852 beams the expected amount of infrared for a star of its class and not a jot more. There’s also no evidence in data taken by NASA’s Wide-field Infrared Survey Explorer (WISE) several years previously that a dust-releasing collision happened around the star. After examining the options, the researchers concluded the best fit might be a shattered comet that continued to fragment into a cascade of smaller comets. Pretty amazing scenario. There’s still dust to account for, but not as much as other scenarios would require. Being fragile types, comets can crumble all by themselves especially when passing exceptionally near the Sun as sungrazing comets are wont to do in our own Solar System. Or a passing star could disturb the host star’s Oort comet cloud and unleash a barrage of comets into the inner stellar system. It so happens that a red dwarf star lies within about 1000 a.u. (1000 times Earth’s distance from the Sun) of KIC 8462852. No one knows yet whether the star orbits the Kepler star or happens to be passing by. Either way, it’s close enough to get involved in comet flinging. So much for “natural” explanations. Tabetha Boyajian, a postdoc at Yale, who oversees the Planet Hunters and the lead author of the paper on KIC 8462852, asked Jason Wright, an assistant professor of astronomy at Penn State, what he thought of the light curves. “Crazy” came to mind as soon he set eyes on them, but the squiggles stirred a thought. Turns out Wright had been working on a paper about detecting transiting megastructures with Kepler. In a recent blog, he writes: “The idea is that if advanced alien civilizations build planet-sized megastructures — solar panels, ring worlds, telescopes, beacons, whatever — Kepler might be able to distinguish them from planets.” Let’s assume our friendly aliens want to harness the energy of their home star. They might construct enormous solar panels by the millions and send them into orbit to beam starlight down to their planet’s surface. Physicist Freeman Dyson popularized the idea back in the 1960s. Remember the Dyson Sphere, a giant hypothetical structure built to encompass a star? Even Wright admits that the “alien hypothesis” should be seen as a last resort. But to make sure no stone goes unturned, Wright, Boyajian and several of the Planet Hunters put together a proposal to do a radio-SETI search with the Green Bank 100-meter telescope. In my opinion, this is science at its best. We have a difficult question to answer, so let’s use all the tools at our disposal to seek an answer. In the end, it’s probably not an alien megastructure, just like the first pulsar signals weren’t sent by LGM-1 (Little Green Men). But whatever’s causing the dips, Boyajian wants astronomers to keep a close watch on KIC 8462852 to find out if and when its erratic light variations repeat. I love a mystery, but answers are even better. What do you think you are a pearson puppeteer? If these massive dips in brightness are not occuring periodically there’s no reason to think that the obscuring objects are orbiting the star in question. Exit silly alien megastructure / ‘Dyson sphere’ hypothesis. What about rogue black dwarfs (dead stars that emit neither light nor heat radiation) drifting far from KIC 8462852 and coincidentally crossing our line of sight to that star? I’ve read the universe isn’t old enough for black dwarfs to even be around yet. Even if they existed in the numbers you suggest, why don’t we see any similar irregular flickers in any of the other ~150,000 Kepler stars? Yes, after 60 s of online research I realise that you are correct. “Various white dwarfs cooled below 3900 K (M0 spectral class) have been found recently by astronomers using MDM Observatory’s 2.4-meter telescope. They are estimated to be 11 to 12 billion years old.” (Source: https://en.wikipedia.org/wiki/Black_dwarf). Or, in other words: I don’t know, but it’s nice to have a mystery. And NO… no Aliens! And… the Vogons are sending us their poetry in a code even more atrociously bad than the poetry itself. These would actually cause the star to brighten due to lensing, IIRC? IIRC = if I reason correctly? Would such a small star have enough gravity to cause lensing? Anyway, black dwarfs can’t exist, and a single cold object drifting in interstellar space wouldn’t cause the cluster of dips. I don’t accept the comet-that-broke-apart theory either. Too small. It IS perplexing. Anybody got a brilliant theory? BUT – and it’s a big BUT – microlensing causes an UPWARD spike in brightness. Another possible explanation bites the dust. Thin artificial solar panels can be rotated at will, for whatever reason. Cooling? Assembly process? Disarray as a leftover of a demised civilization? How could comets cover 22% of a star, an F3 star with 1.58 Solar radius? It can’t be dust because AFAIK that would be seen in IR. So, substantial cometary blocks together corresponding to about a 0.7 solar radius object. In our line of sight all at once. I don’t understand why that is even proposed as a hypothesis. Why don’t these high albedo icy comets boost the light curve by 10%+ with reflected light when they orbit at the other side of the star? One of the scenarios the researchers alluded to was a possible temporary grouping or alignment of comets with dust halos to create the 22% drop. But wouldn’t the dust cause IR emissions, which is lacking? And be partly transparent, requiring an area larger than 22% of the star’s disk? The Sun seems to have 99.86% of the mass in the Solar System and most of the remaining 1/700 is in Jupiter. There would need to be many thousands of times more comets there than here. And I would think that a 22% sized icy (i.e. high albedo) comet cloud should reflect some starlight when it is on the further side. But the light curve doesn’t have any peaks. I was just watching the Weekly Space Hangout over at UniverseToday.com with Kimberly Cartier at Penn State (http://sites.psu.edu/astrolady/), who is directly involved in this research. The point is not only that the light-curve dips are aperiodic and extreme (Jupiter in front of this star would only cause a 1% dip), but that their profiles are widely variant and asymmetrical! The objects must therefore be irregularly shaped. Huge, irregularly shaped objects – the mind boggles! 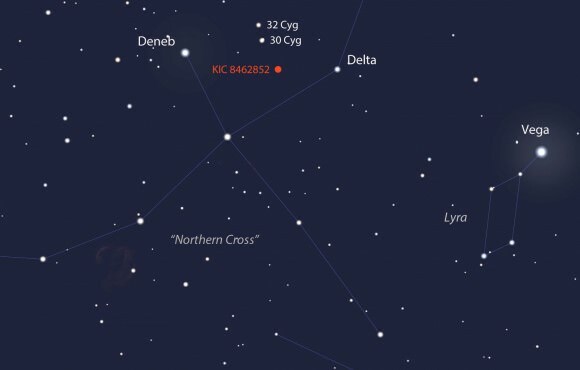 How far is KIC 8462852? ie: Is there any possibility that improved resolution devices might someday actually resolve the larger-dip-causing elements? We now have Pluto and Charon proving that binary planets occur. Is it possible that more than one binary (or even tertiary?) planet system orbiting the star could produce the dips we see? 22% dip in the light curve? 15% dip? Wow! Is there a too-dim-to see, multi-star system (with its own groups of multi-planet systems) orbiting this star? Or all that plus star-spots? 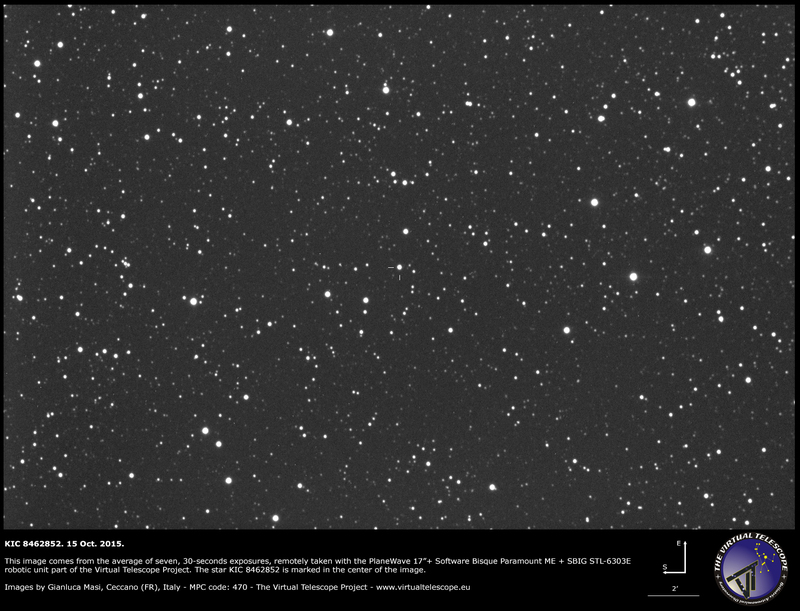 What is the maximum theoretical dimming from a star spot or start spot system? I, for one, am clinging to natural causes. The star is ~1,480 light years from Earth. I think the problem with multiple planets in orbit is that we’ve detected multiple planet systems with Kepler, and I have to assume the researchers would know how to unravel the dips to arrive at a possible multiple scenario. Multiple planets would also have repeating periods/cycles, but these signals do not except for the 20-day cycle, which remains unexplained. Is there anyone seriously gathering pre-discovery data on it? At 12th mag it would be sure to show up in lots of previous catalogs and observing campaigns. I gather the star was never called a variable star before so maybe few or no dips show up. But even a pattern of full-brightness observations may help decode things as the light curve is carefully watched going forward. And I could imagine amateurs contributing to a campaign going forward watching it, no? We are possibly seeing a lot of planets orbiting the star. The periods of which would vary so that we are seeing irregular ‘shadows.’ Simple solution is plot all the ‘shadows’ and then measure for periods of equal length. The odd ‘shadows’ are just planets with longer periods than what the combined data has. I’m thinking some of the planets may be huge planetoids that just never formed into one whole planet because of the proximity to a gas giant. None of the proposed explanations sound right to me. Comets, dust, planets, even record setting gas giants, are all too small to account for 20% occlusion. Even a maximum brown dwarf companion seems too small, and I expect a brown dwarf would show detectable variations in the infrared. (Would it?) With brown dwarfs or huge planets, there’d be wobble. And it would hardly be unique. Why no talk of stellar dynamics? Can’t the star be doing it on its own? That seems more reasonable to me than such wild transits. Maybe something like a pair of brown dwarfs is in the nearby foreground, orbiting each other, occasionally occluding the background star. Brown dwarfs are hard to detect, and if they were close enough to us, they could block any fraction of a star’s light, even 100%. The brown dwarfs could also have planets with them that would add to the chaotic effect. The period might seem weird and “impossible” because they aren’t orbiting the distant star at all. Combine that signal with some ordinary local planetary transits, and you have a really messy signal. Even on the assumption that it’s aliens, though, I still don’t like the idea that some chunk of physical alien something is blocking 20% of the star’s light. If it’s aliens doing it I bet they’re using a ray gun or something exotic, and not a 3 million km solar panel. Bear in mind that I know nothing about it, and I do know that I don’t know. But if I had to bet, I’d gamble on inexplicable intrinsic stellar variation over inexplicable giant sunglasses. Anything is probably more likely than my home-brewed amateur “interposed binary brown dwarfs” hypothesis (because the source is just some guy with an iphone), but at least my brown dwarfs model works (if it works?) without inventing new objects or megacivilizations. If I knew more, enough to say the brown dwarfs couldn’t be 100% ruled out, then I would switch my vote to the dwarfs. I like the idea of foreground objects, but you’d think WISE would have uncovered any such nearby brown dwarf pair. Still, a reasonable idea. Being a variable star observer, I also thought of erratic, intrinsic pulsations as the cause, but if you read the paper, the group researched old plates and found no significant variation over the past 100 years. However it’s certainly possible no activity was in progress when the plates were exposed. It also shows the wrong type of dips to be an R CrB star and lacks the infrared excess of a Be star surrounded by a belt of debris. Frustrating but some sort of variability is still my own personal favorite hypothesis. Then I’m changing my vote. It’s aliens! Thanks for the more details, awesome. I hadn’t heard that on other sites either. Edit to add: Brown dwarfs are pretty hard to detect. We can’t directly see them very far away. They could be maybe 300 LY(?) away, too small to see except as transits? A binary brown dwarf could have recently drifted into interposition, explaining the no-previous-activity. Or it’s a combo of the two: a vast, interposing alien attack fleet drifting into the Sol system. Ordinarily I would agree, astrophysicists think they mostly understand stellar dynamics. The problem is, astrophysicists also mostly understand large orbital bodies & comets & such. So whatever this is, it appears to be something less well understood. Either it’s unicorns, or it’s something new about stars or orbital bodies. Stellar dynamics is mostly understood through theory. Practice is always messier. As you suggest, maybe a large planet collided with the star and these are the residual effects – or any other rare event that we haven’t got much experience observing. Or a herd of unicorns. Or it’s just something stars do, but very rarely. How many of these large dimmings have been observed? Just two? If so, however unlikely, maybe it’s two unrelated phenomena. Who says planet collisions have to generate observable amounts of dust? Why not two gas giants in some hit-and-run collision? I would guess that would pull out streamers and clumpy clouds. You would need relatively little mass to create large clouds that could dim the star light significantly. That doesn’t sit quite right with me either, but it might turn out to be the best guess. Sounds more likely than aliens or invisible brown dwarfs. (crackpot!) And a belt of irregular gas streamers might account for the irregular transit times and “odd shapes”. Still, i think you’d need a lot of gas. It would heat quickly and I’d think glow brightly in the IR. I think that’s exactly what they don’t detect. I don’t think gas like this would glow in the IR. That is from warm blackbody radiation from solid objects. Atoms or molecules of gas, probably mostly hydrogen from a gas giant, would radiate in discrete lines and then only if its electrons were pumped up by something else. If those discrete lines are there, they might be hard to detect against a background of a zillion other sources. Maybe Mr. King knows if that holds, or not. Excellent Bob your writeup throws up the max info and angles to this extremely curious discovery. Not planets and NOT comets either NOR any cosmic body. The clues are VARIABLE upto 22% dip in light and IRREGULARLY timed transits. Whatever is going around that star is in an active propelled orbit, made up of multiple shaped objects swinging around with variable orbital distances and is HUMONGOUS to block out half the light of an already massive star. So whats going on folks?! Thank you very much, Sangos! Wouldn’t a partially built alien megastructure also show up in the infrared, for the same reasons that dust would? I have another objection to the Dyson Sphere hypothesis, and that is why an alien civilisation would want to build one. Could they possibly need that much energy? What would they do with it? Of course they need energy – to build more panels! I wondered about infrared excess from heated panels too, but perhaps there are structural materials (carbon fiber?) that radiate far less heat than metal. The material wouldn’t effect the total heat emitted, though it would determine the wavelength. You could absorb the waste heat for a while until your gear got hot, or re-radiate it in a preferred direction, but efficiency cannot reach 100%, and energy is conserved, so there will be a fixed amount of waste heat in any system, and all of it must go somewhere. Let’s wait for the doppler and spectroscopic studies, that will tell us about the mass of any orbiting objects. Would love it to be aliens (just for the effect on politicians) but if not it could be something very interesting indeed. Do we have already seen (in reality, not just on computer models) what exactly happens when a main sequence star run out of fuel in the nucleus and begins contracting and burning H in the inner shell ? Couldn’t that (or something of that kind) explain these apparently random dips in luminosity ? Based on its rapid rotation rate, it’s likely a young main sequence star. The authors describe it as “ordinary” with no unusual spectral lines. One thing the authors have NOT ruled out are pulsations. They write that KIC 8462852 may be related to the Gamma Doradus variables which show non-radial pulsations (unlike say, the classic radial pulsators, the Cepheid variables), but as far I can see, even those have repeating periods. Well. sure… but if it is indeed a young star, that goes also against the aliens right ? Variable stars are really an interesting subject that I know very little about. Could you advice me for further reading ? O.K. We have no solid proof what is causing this but i think there is a Black Hole between the Star and Earth that is warping the true effect..
Would it be fair to say that this is the most important ‘smoke signal’ we’ve ever received from the cosmos? I just can’t think of a natural explanation for this phenomenon. Not even highly chaotic motions of a large number of huge protoplanets fits the bill, because there have been long periods without any dips in brightness, and there is no evidence of periodicy. Mercury orbits our Sun every 88 days. KIC 8462852’s Star is 1.5 times the size as our Sun. A 20-day orbit around 8462852 I would assume would be very fast and very hot. Hot enough for smelting I assume? It seems like if you were building a mega-structure or adding new panels to a mega-huge solar power array, you’d probably want the smelting plant somewhat close to what you’re building. Then every 20-days the smelting facility ‘flings’ out the mega-huge smelted piece towards it’s intended destination. At the same time some fairly common ore is brought in from nearby systems and added to the smelting operation. When they had enough components to complete the section they were working on, the ‘smelting facility’ was removed from it’s 20-day orbit. First off i would like to say how interesting and well written this article is as well as the comments that followed. Looking at the problem, it seems there are innumerable conclusions that can be drawn based on the evidence i have seen, and that evidence also raises a lot of questions. One of these being the light dips of the star, are they completely static throughout the duration of the anomaly or is there a path to it? If so can this path be traced in repetition, suggesting a orbit of some kind or form. On the subject of a Dyson sphere seems odd to me that any kind of advanced intelligent life would use a solid mass too orbit a star with the sole purpose of collecting energy, as surely a gas or liquid would function far better and be much easier to form into the large mass seen. perhaps giving explanation for the irregular size and shape of the fluctuations. I am also sure there are many things within the universe that have not and will not be discovered for long after we have all gone and passed, things that are currently speculated upon like dark plasma another potential possibility. Furthermore the distance of KIC 8462852 and the technology we use to observe it simply leaves a lot of holes, holes that can only be filled by guess work, and Hypothetical theory’s. I’ll bet a beverage that we humans work out a plausible solution very soon, and a solid solution very soon after. It may (or may not) require more observational data. It may be much sooner (it may have happened yesterday), but I bet, conservatively, this will be in the bag by 2017. Don’t forget, one of the intelligent species in the Milky Way is us. We were clever enough to invent WISE and Keppler, and to make note of the KIC anomaly. Now we want to know what it is. Curious about something. If a civilization is advanced enough to create solar panels in space, presumably the next/ultimate step would be to make a proper dyson sphere. Given this, how long in that civilizations existence would the solar panels be around before being replaced by a sphere? 10 years? 100? 1000? What are the chances that we’d detect a civilization in this intermediate stage? In my most humble opinion I would think there would not be enough material on their alien planet to build something so big to cover a star so large. Hello, hinchdh. For this theory, they would likely be mining the minerals from nearby star systems and centralizing the minerals/ore by this system’s star for smelting. Right, there would not be enough minerals in a single star system for the structure(s) as theorized. Why assume it’s their home planet? Maybe it’s an uninhabited star system they chose and traveled to. If it’s their home system, maybe they use material from their home planet, but more likely they’d use material from asteroids, moons or other planets. 10mil x 10mil x 10mil x 3.14 = 3,140,000,000,000,000,000,000 (3^21, or three septillion) square km. Now, how thick is it? If it’s a kilometer thick, then it’s 3 septillion cubic km of stuff (30 billion earths, or 30 million Jupiters). Much more stuff than exists in our solar system. 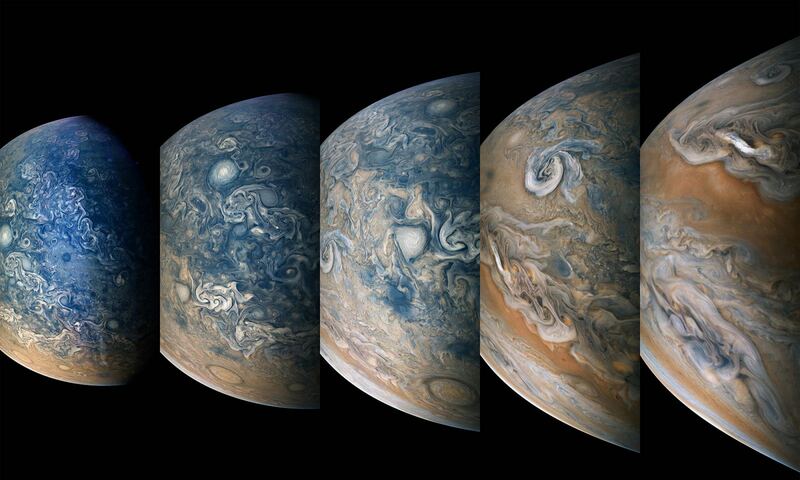 If it’s a thousandth of a millimeter thick, like a soap bubble, then it’s “only” 3 quadrillion (3^12) cubic km of stuff (about 30 earths’ worth, or just a third of a Jupiter). That’s a “reasonable” (huge!) amount of stuff, but it’d be much thinner than any condom. Hard to imagine. If it’s right in between, a meter thick, then it’s 3 quintillion cubic km (30 million earths, or 30 thousand Jupiters.) Still more than the whole solar system. That’s only considering volume of “stuff”, rather than mass, which is very inaccurate, and disregards what Jupiter is made of (mostly gas,) but you get the idea. So get the material from other stars? Hauling dozens of star systems’ worth of material across interstellar distances seems like a pretty big job. Just a guess, but I bet the energy expended to shift that stuff exceeds the energy gathered from the star in any short term. If you had the energy to move 30,000 planets over 30 light years, why even mess with Dyson spheres? That’s just too much stuff. It’s hard to imagine how it even holds together, even with fancy alien materials and technology. And it’s hard to imagine how any sphere can “orbit” a star without going haywire. It scales down nicely, though, if you consider a Dyson swarm instead if a sphere. It’s much much simpler, the components could be very flimsy, and you could have as few or many collectors as you wanted, each in its own orbit. We could start building a modest Dyson swarm tomorrow with current tech.